This article is based on part two of the ANSWER posted Webinar/Teach-in offered by the Task Force to Stop THAAD in February 2017. THAAD stands for Terminal High Altitude Area Defense System, a type of powerful radar-driven defense system developed by the United States. StopTHAAD is a coalition of U.S. based organizations formed to promote genuine peace-building. The goal is to encourage diplomacy, reduce militarization, and end the U.S.-South Korea war games. 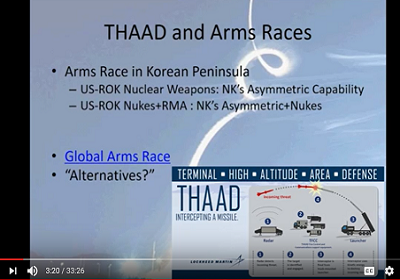 Dr. Jae-Jung Suh, Professor of Politics and International Affairs explains what THAAD is in “THAAD & The Global Arms Race.” This Webinar/Teach-in is dated February 13, 2017. (That was two months prior to the actual THAAD installation on April 26, 2017 in Seongju City in the Republic of Korea (ROK)(aka South Korea)). 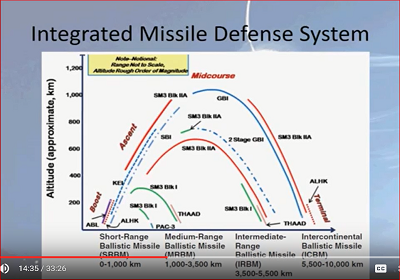 It is relevant for anyone interested in learning about the build-up of missile-defense systems (MDS) and how they are being used to support first-strike capability. While it appears to tip the balance of power on the side of the US-ROK, the take-away is that THAAD exacerbates the global arms race not just between the two Koreas (North Korea aka DPRK and South Korea aka ROK) but between Russia and U.S., and between China and the U.S. The only reasonable solution is dialogue leading to diplomacy that involves de-escalation and arms control. 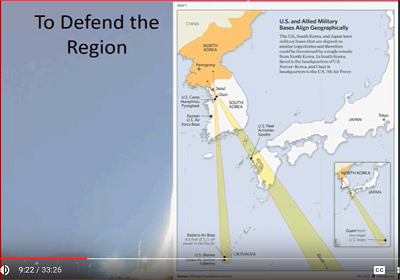 “The Fight to Stop U.S. THAAD Deployment in South Korea” Webinar/Teach-in also featured speaker Ray McGovern, former CIA intelligence officer and Veteran for Peace Board Member (in part one). The event was facilitated by Hye-Jung Park of the Philadelphia Committee for Peace and Justice in Asia. Dr. Suh’s lecture has three main points. They are that THAAD needs to be understood as part of an arms race. THAAD is adding to the global arms race, a race between the superpowers of U.S., Russia, and China. However there are alternatives which are better and feasible. The U.S. began deploying nuclear arms in South Korea (ROK) in 1958, and kept hundreds of them there until 1991. Under the first President Bush (1989-1993) there were global arms reductions and many weapons were pulled out. Nevertheless enough remained so that North Korea (DPRK) created countermeasures such as amassing many conventional forces at the border and developing long-range artillaries. Thus in the 2000s although there was mutual deterrence, a raised level of threat and danger was involved. At the start of the 21st century, it was estimated that the concentration of firepower in the area between Pyongyang [North Korea capital] and Seoul [South Korea capital] was greater than that in Central Europe during the first Cold War….According to the New York Times, in 2014, US President Barack Obama ordered the intensification of cyber and electronic warfare to disrupt North Korea’s missile testing. 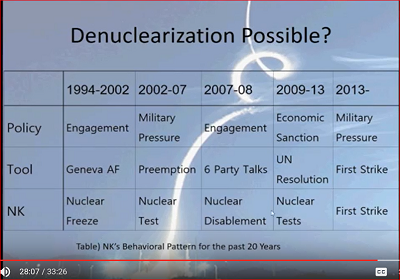 Suh goes into detail regarding the variety of NK countermeasures and ongoing research, resulting in what is now roughly first-strike : first-strike balance. According to Suh, however, THAAD has increased investment value over the extant ABM for several reasons. Ostensibly THAAD is being used to defend the ROK; however like Dr. Postol, Dr. Suh believes it will underperform in this role due to its inconvenient distance from Seoul (the capital of Korea) and the fact that DPRK’s offensive missiles are mostly low-flying shortrange missiles. Instead THAAD is better situated and designed to defend the region of NE Asia against NK missiles targeting Okinawa, ports in Japan, or Guam. THAAD missile defense system uses radar to hone in on long-range high-flying missiles such as ICBMs which is important if the target is the U.S. continent. For instance, THAAD could detect and intercept, or relay for interception, satellites launched by North Korea carrying nuclear or EMP bombs ready to detonate on the U.S. continent. (High-intensity electromagnetic pulse (EMP) bombs are designed to wipe out the electrical grid and electronic devices all over the continent). The important point, according to Suh, is that THAAD immediately and effectively intensifies the arms race on the Korean Peninsula. By extension, with the mutual defense agreements between US-South Korea and between North Korea-China, and cooperation between China-Russia, THAAD greatly adds to the global arms race. Both China and Russia still view North Korea as a strategic buffer between their own borders and US-aligned South Korea, which hosts considerable American military forces. North Korea’s economic and political collapse would destabilize the region, including South Korea. For decades, Beijing has insisted that the tensions on the Peninsula which date back to the 1950-53 Korean War, can be resolved ultimately only by the withdrawal of the U.S. from East Asia. Tensions in 2017 have actually increased for each month since President Trump has taken office. 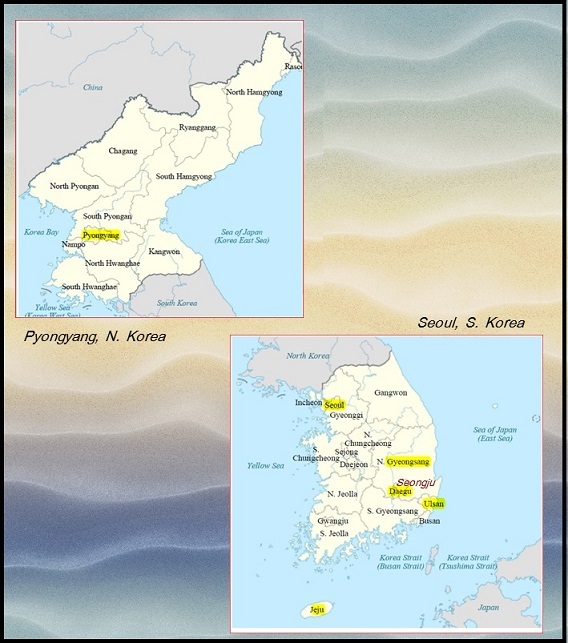 As troops and weaponry continue to amass along the DMZ, additional troops along the borders by China and by Russia, and naval exercises and fly-bys, provocations and skirmishes may spark a new Korean War, as happened in 1950. Furthermore, according to Dr. Suh, China views THAAD as an invasive threat because such missile defense radars whether based in South Korea, Japan, or on AEGIS destroyers can be used to pinpoint the location of Chinese ICBMs. The global arms threat to Russia has greatly increased due to Obama-era construction of new missile defense systems (MDS) in Europe, and from new deployments in the Mediterranean, in Romania, as well as proposed installations in Turkey. Dr. Suh’s presentation included slides showing MDS locations and graphs depicting the estimated height and range of various MDS including for THAAD and SM3 types. Finally Suh talked briefly about pursuing meaningful diplomatic talks. Based on past behavioral response patterns, neither economic sanctions nor military threats work. Because THAAD appears not to be intended to do anything except hasten new and devastating wars on the Korean Peninsula, if President Trump would stop the military exercises, such as Key Resolve, and commence diplomatic talks, such as the Six-Party Talks, that would be ideal right now for helping true world peace.